I’ve been baking Fool Proof Chocolate Bundt Cake with Fudge Frosting since we first got married over 35 years ago! It’s the perfect cake when you’re looking for a dessert that takes a few minutes to throw together with amazing results every single time. Fool Proof Chocolate Bundt Cake with Fudge Frosting is a semi-homemade cake that has been a Foster family favorite for years. I’m pretty sure I got this recipe from my sister in law, Sheri, way back in the early 80’s. 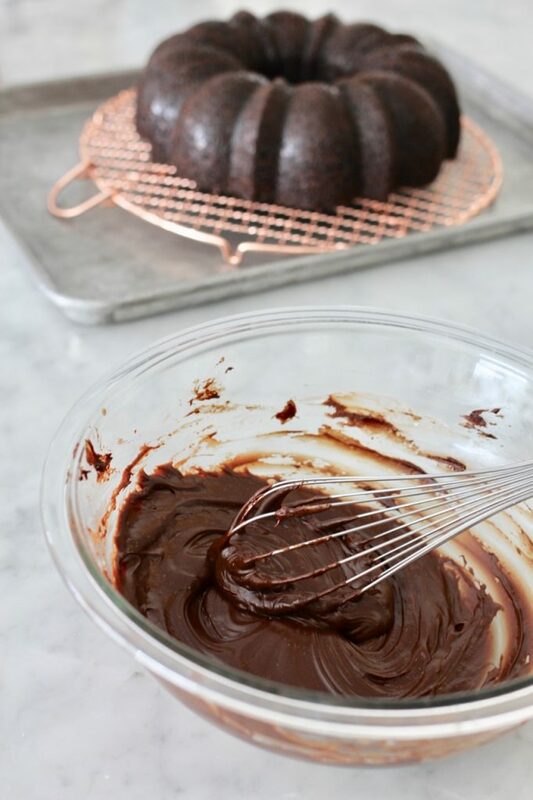 If you’ve got a bundt pan and a few minutes, this cake can be your dessert in about 90 minutes! Most of the 90 minutes is spent baking and cooling, which is often referred to “inactive” time in recipes. 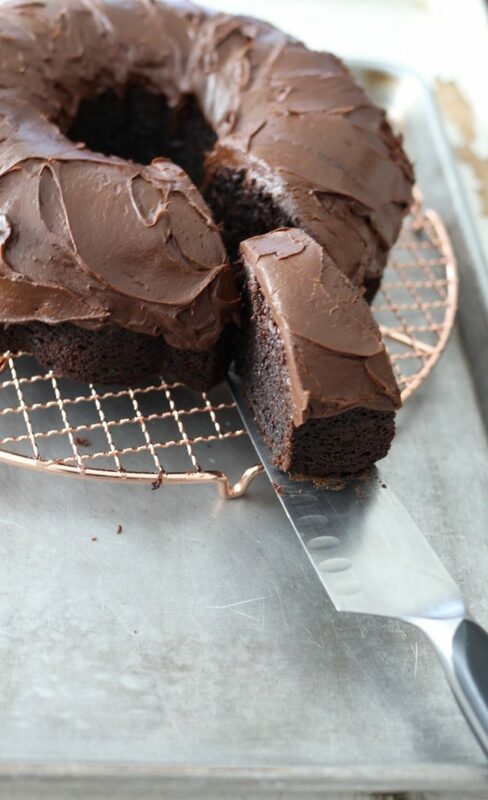 Top 5 reasons I love this cake, and why you will love Fool Proof Chocolate Bundt Cake too! 3. I usually have all of the ingredients on hand. 4. It travels well, sliced or unsliced. 5. Who doesn’t love a BUNDT?! Name that movie. 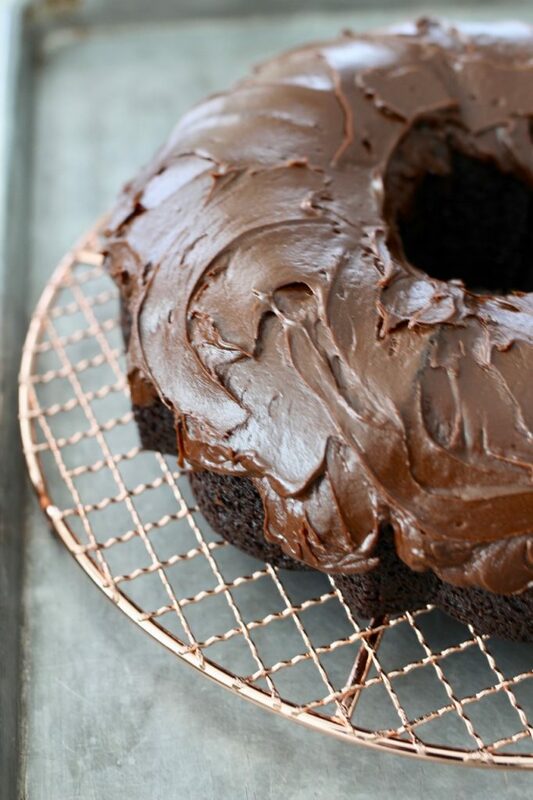 Fool Proof Chocolate Bundt Cake with Fudge Frosting is everything I’ve listed above and more. If you are just learning how to cook, and want to master a cake as your go-to dessert, this is the perfect recipe. With the help of the boxed cake, and topped with a simple homemade frosting, it’s a great way to start baking without the risks of making a 100% from scratch cake. Over the years, many people have told me they had one epic fail early on in their marriage, or when they moved out and started cooking for themselves. That one fail led to the dreaded “I can’t cook” or “I’m a bad cook” label. Starting out with recipes that are simple and building from there will help you gain confidence to move on to more challenging recipes! I love the versatility of this cake as well. It is pretty enough to serve at a party or simple enough to whip up and enjoy for a weeknight dessert. I’ve also taken this cake to countless gatherings without a problem. Just bake as directed, frost, let the frosting sit for a while until completely set (or place in fridge for about 30 mins) and then cut and place on platter. I also like to make this Lemon Poppy Seed Cake and serve it on the same platter, sliced for a pretty presentation. Other semi homemade but totally amazing cakes are Nan’s Coconut Cake , and for birthday celebrations, ABK’s Funfetti Birthday Cake. Give one of these recipes a try next time you’re looking for a quick and easy solution for dessert. I’d love to see what you’re baking tag @abountifulkitchen on Instagram! Quick and easy cake for any type of gathering made with cake mix and pudding and baked in a bundt pan. The most moist and rich cake you will make in a matter of minutes! *Generously grease a bundt pan. Combine cake mix, dry pudding mix and sugar together in bowl. Add rest of ingredients, mix until all ingredients are combined well (with mixer), about one minute. Pour into prepared pan, and bake on middle rack of oven for about 50-60 mintues or until toothpick inserted in center of cake comes out clean. Remove from oven and place on wire rack. Let cake sit for about 5 minutes, loosen edges with a table knife, and invert onto a platter. Melt chocolate chips in double boiler or microwave safe dish. Add the butter and beat until smooth. dd remaining powdered sugar, continue to mix until desired spreading consistency. Heat about 3 tablespoons of heavy cream in a bowl in the microwave for a minute or on the stovetop in a sauce pan just until hot. 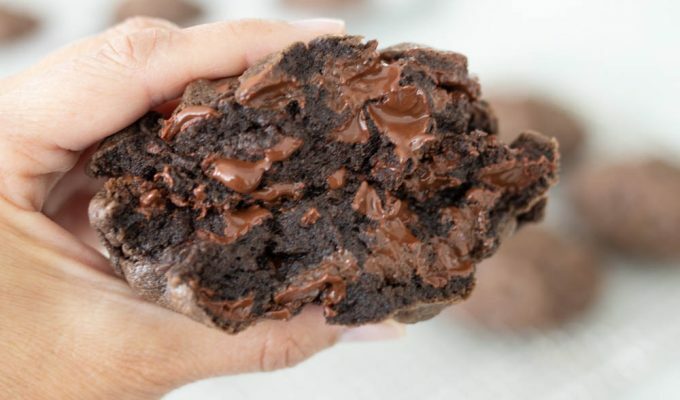 Remove from heat source and stir in 1 cup of chocolate chips (I prefer semi sweet) with fork or whisk until the chocolate is melted and smooth, then spread on top of the cooled cake. The cake in the photo on this post is topped with this frosting. When baking a cake in a Bundt pan, it took me a LONG time to figure this out: Generously grease the pan- key word generously. I use PAM, a cooking spray. Any type of cooking spray, or brushing the pan with oil will work as well. I don't use solid shortening bc it may leave a white film on the baked goods after they cool. Spray the pan right before you fill with batter. This recipe works with any combo of: choc cake/choc pudding, choc cake/vanilla pudding, yellow cake/choc pudding. Works with low fat sour cream, but better texture with regular sour cream. You can make this in two 9 inch loaf pans. Start checking for doneness at the 45 min mark. Line the bottom of the pan with parchment or wax paper, grease paper. Great with or without the frosting. Stores well for about 5 days if covered. EStupendo, se ve totalmente delicioso. …and it's round, like the circle of life. this might be a silly question, but do you make the pudding first or just add the instant pudding powder to the mix? Not a silly question! Add the pudding mix dry. I'll amend the recipe. Yummm…I have a recipe similar to this one except you use a yellow cake mix, and I don't frost it. I'll have to try your version. I love the one I make. My kids love to quote phrases from "My Big Fat Greek Wedding", every time a make a bundt. Thanks for all the wonderful recipes, Si. I still get to benefit from your great cooking skills even though we haven't had recipe club forever. I'm making graduation brownies for my Sunday School class this morning. Thinking of you. who doesn't love a good bundt is what I always say. I used a silicone pan and hardly had any butter pam spray and it didnt stick at all!! I totally will continue and reccomend using silicone pans! My aunt asked me to make her wedding cake. This is my first wedding cake, will this recipe work for it? I have made this cake for several occasions. I would experiment in the pans you will be using to see exactly how many layers you can get out of one recipe. Im guessing this will bake up nicely in 2 9 inch pans. Good luck! This is a favorite of our family. It always turns out perfectly! Thanks Sheri! You can’t go wrong with this recipe. It’s definitely a favorite for our whole family. We’ve been making this bundt for years and love it! We don’t frost it though we serve it warm with vanilla ice cream and a simple caramel sauce. 1 cup heavy cream, I cup brown sugar and I cube of butter. 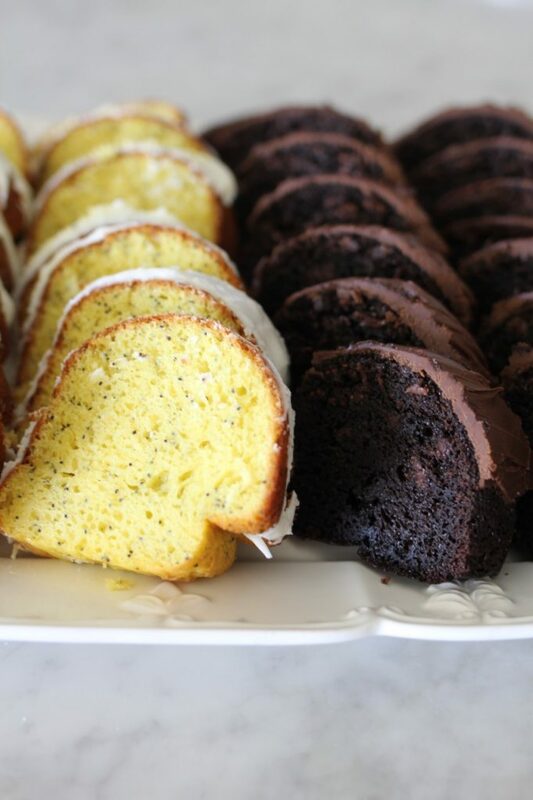 Could this cake, and the lemon poppy seed cake, be made the day before? How do you recommend storing them? I love your blog! I aspire to be able to make all these things effortlessly for my family some day! Hi Elizabeth, yes they can be made the day before. I recommend storing them in the freezer and then taking them out a few hours before serving. Hope this helps and thank you so much! Frosting and all? Or would you frost them the morning of? yes the extra batter will bake up in a muffin tin or another small cake pan. This batter is also enough for one jelly roll or sheet pan size cake! I plan on making this cake for a party and I was wondering where you got your serve tray in the photo. I’d like to do mine like that when I serve it. Thanks! You will love this recipe for parties! I purchase a lot of my trays for serving at Homegoods or TJ Maxx. If you have one nearby, take a look. Their prices are always amazing for large serving pieces! A recipe sure to help you 1. Make all your family friends think you are a baking genius and 2. Make more friends! So easy and so tasty!! Thanks so much for your comment, Jessica! 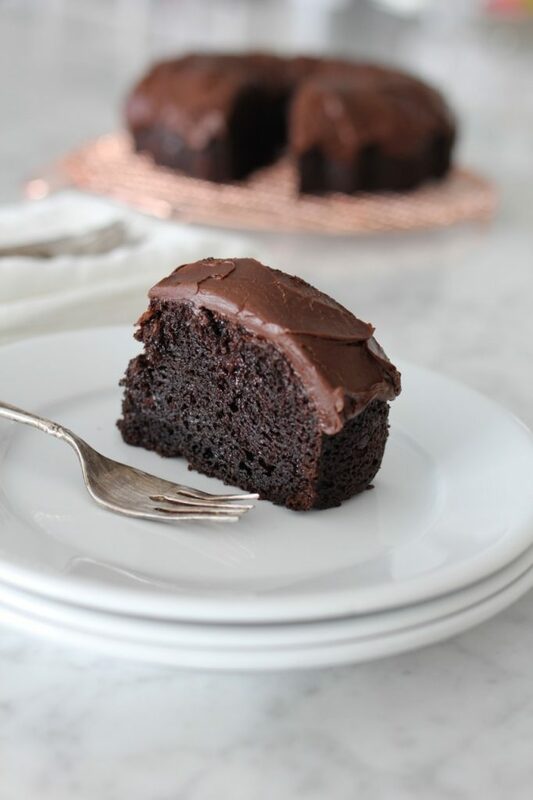 This is truly one of my favorite chocolate cake recipes ever. I love this recipe and have used it many times over the years. People die when I tell them it’s a combo of a cake mix and sour cream! I often use this for layer cakes. I prefer 9 inch pans and cook for 30-35 mins depending on the days humidity. It rises high so don’t let that fool you as it will settle down as it cools. Thanks for sharing such a great recipe! Thanks for sharing your method of using 9 inch pans, Sigrid, it’s very helpful for other viewers. It’s amazing how simple yet delicious this recipe is, especially with the cake mix and sour cream.